Looks like the final version still had "reservoirs" spelled incorrectly. Oops! Any chance this can still be updated? Nothing else about the map changed - just corrected the typo. I'm an OHSU grad student ... awesome! Sorry, but how did this get a graphics stamp? iAmCaffeine wrote: Sorry, but how did this get a graphics stamp? Why would it not get the stamp? What in your opinion is wrong with it? Such a low standard, it doesn't stand up to any of the current maps, apart from Philadelphia but that's not saying much. I rather like it - not too garish, crisp/clean delineation. Beats London (a city deserving of a much better map) hands down. OK, but again, what is wrong with it? Considering this one had longer than normal in the foundry and also a long beta, it might come down to a lesson learned. Comment early, see changes made, comment late, see them ignored by map makers. iAmCaffeine, been noticing you a lot lately over in #GCCM thread , this was the whole point of it. To get payers like you here commenting on the maps. But it would be nice to get you commenting on maps whilst they are being made. I did a little on Alaska but I'm struggling to find time for the forums at the moment. I didn't expect any changes to happen here, I just played it and thought it was terrible. The worst part is the map title on the left, by a mile. Also CoF, agreed regarding London. I don't understand why opinions about this map are so derisive. There are a lot of great maps (both in terms of graphics and gameplay), but most look like they were made by a 12 year old in MS Paint. I get that the aesthetic is different than the majority of maps, but at least its clean and crisp and bright and it has some unique gameplay attributes. I'll never understand the majority preference for dark, choppy maps with identical gameplay, but to each their own I suppose. I'm a bit disappointed that Portland got skipped over for bot games. 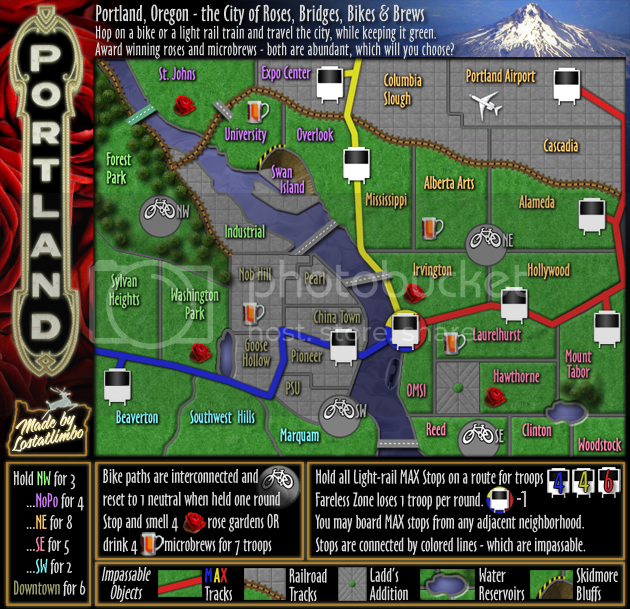 Btw, the map title you hate is an iconic sign in downtown Portland. Everything on the map has a direct, notable relation to the city. The comments aren't so much directed at you as they are the cartographers, at least mine are. It's pointless now though. It will have been overlooked for bot games because of the killer neutrals; only basic gameplay maps can be used with bots. 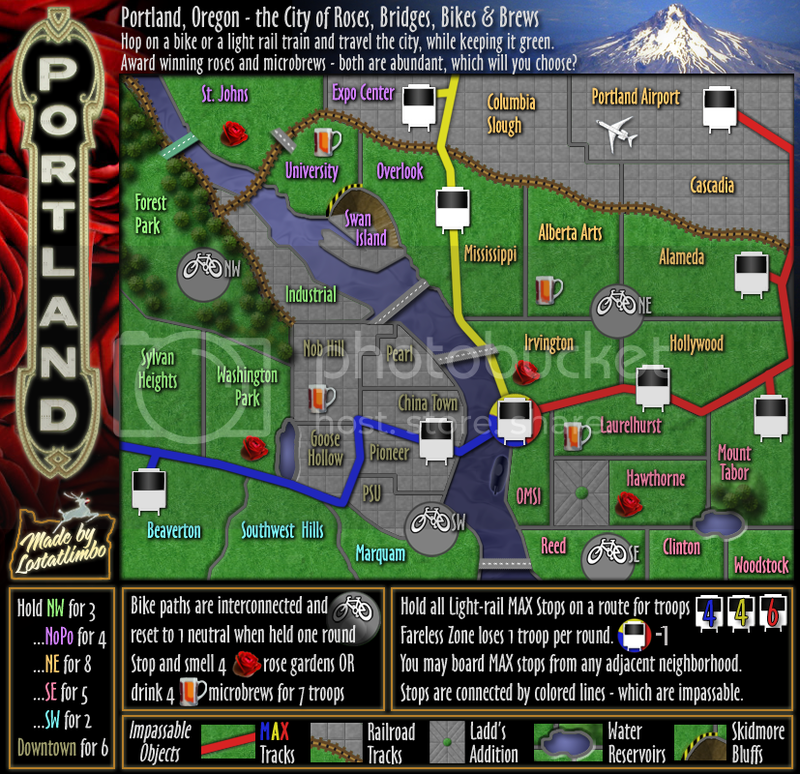 I'm a Portlander, but that said this map is one of my favorites. Lost did a great job capturing Portland landmarks and putting them into play...not to mention his use of the roses and the beers. The game play gives a lot of options and different ways to win, which is a welcome breath of fresh air. Seems to me most maps, you just have to play it enough to know the secret formula and collect your wins against players who don't know the tricks. I know it was a long, arduous process and to lost for seeing it through.